we had this in a chinese fast food joint in Shenzhen during our holidays in Hong Kong. No idea of how to translate it from Chinese to English, so I shall named this as Chinese Pickled Cucumbers. This is not the exact copy of the dish as I do not have the recipe. This is just a trial and error and fix it to work for our taste recipe. Whole family loved it. So here's my recipe for it. 1. 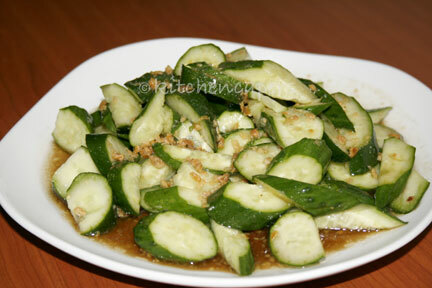 Add sauce to cucumber pieces and toss to mix evenly. 2. Put into a container and leave it in the fridge to chill for at least 30 mins. 3. Serve cold, as an appetizer. 1. Omit Garlic and add 2 tbsp young ginger that is shredded finely. 1. If you want to keep this in the fridge overnight, do not mix the sauce with the cucumbers. The cucumbers will turn soft and watery the next day. 2. If you want to prepare this ahead for a party, do the sauce first. then cut up the cucumbers and set aside. 1 hour before party starts, toss and mix sauce and cucumbers together and chill. Serve cold.